When I stepped off the plane in Thunder Bay, Ontario, Canada I had a brief visit with the Custom Agents to let them see my hard cased Knight Muzzleloader. A quick scan of my gun and a sharp look at my non-resident gun declaration, and I was out the door and into the airport to meet up with Mike Law, Knight Rifle’s cameraman. He was to pick me up and then we would head north to Dog Lake Resort, www.doglakeresort.com, which is the location in which we would be filming a black bear hunt with Paul Delpino and John Covello of Black Bear Adventure, www.blackbearadventure.com, for the next 6 days. This was going to be an awesome hunt as this would possibly be my 3rd bear harvest in less than three months. I’m really getting addicted to this bear hunting stuff, they are amazing creatures! There was only one problem, no cameraman around anywhere. Another wonderful problem to add to the list was that I had no cell phone signal to be able to call Mike and find out exactly where he was and why he was not at the airport to pick me up. Panic started to set in as the airport was empty except for this one young lady behind the counter at a rental car place. This smooth running kick off to the hunting season was rapidly making my stomach feel sick. After gathering up the nerve to tell the rental car lady I was lost without a ride or calling device, she kindly showed me to the pay phone and I dug the phone number out of my backpack for the resort. A few short rings and Michele, Paul’s wife, answered the phone, “Dog Lake Resort may I help you”. My reply was, “I sure hope so”, and then I proceeded to ask her if she had heard from Mike as I was quite worried about his whereabouts. She said that she had just got off the phone with him and he was being detained at the border of U.S. and Canada. It seems he had misplaced an important piece of paper and they would not let him into Canada without it and the only way to get it was to call an alderman in Thunder Bay and have him rewrite the document. Sounds easy, eh’? We’ll I might have forgotten to mention that this happened to be Labor Day weekend and everyone was out for the last holiday of the summer. Mike would be held up in the States for four days until everyone got back to work on Tuesday—this was Saturday. With nothing being able to be resolved for the next few days, Michele came into town and got me from the airport and Mike found himself a hotel south of the border-not Mexico, and we both settled in for the long wait. This was definitely going to cut into to our hunting time and possibly spoil all our efforts to harvest our 3rd bear on camera for Knight’s Born To Hunt TV this season. These are some of the unseen issues we have to deal with when traveling with cameramen and equipment to get hunting shows to the public. Gotta love it! For the next few days I kept in touch with Mike via the resort phone and tried to help around the camp as much as possible. In reality, the only thing I did that was productive for the next few day was to help Paul and John prepare fresh bait sites for guys that were hunting in camp. I must say I was really on a low for awhile, but this down time did give me time to enjoy the beauty that surrounded Dog Lake which normally I would not get to do as there is a ton of work involved in filming TV shows. It was a welcome break, but the anxiety was building slowly as the week progressed. The Weather Channel kept saying the end of the week looked to be holding heavy rain storms that would stick tight once they started. This was not good as I was relying on the end of the week to get our hunt done! Like molasses on a cold winter day, Tuesday finally rolled around. It was go time as Paul started calling the Board of Tourism as soon as the offices were open for business. 8:01am he had the main guy on the line and the ball was rolling. Mike should have the papers by mid-evening putting him in camp by dark Tuesday evening. This would allow us to hang stands mid-day Wednesday and start the hunt immediately. Talk about a full court press, this could possibly be our only day in the stand if the Weather Channel was even close to being right on its prediction. As hoped, Mike was finally standing in my cabin just as dark started to set in Tuesday night. I think we were both elated to be able to start the hunt whether it was on time or a few days late, either way, we had a job to do and it would start as soon as light hit the next morning. As the many lazy days before, we had a great breakfast at the lodge before the day got its start. This one would be a bit different than the ones prior, however, as today I would get my bear hunting license and be at the starting line for the hunt- 4 days late. After a quick discussion with John on the location of our stand and what we should expect for shot distance, we loaded our stands, camera gear, and clothes for the long sit ahead. One thing that seemed to follow true for both places I have hunted bear; the timber is really thick and dark. Slipping into our stand site for the first time was a bit eerie as we didn’t know what might be around the next curve, an added flavor to the hunt I might add. Not too fear though as John led the way making plenty of noise to let any bear in the area know that he was coming. These sounds were normal sounds that he always makes when freshening up a bait site. Now it was up to Mike and I to hang our stands and gear without making any non-normal sounds that would alert the bears of something different about John’s trip in. With veins popping out on our heads and sweet rolling off our noses, we got everything in place in a matter of minutes virtually in stealth mode or as stealthy as two guys in a pine tree could be with tons of gear. Finally, we gave John the thumbs up when we were on our A game and he dropped the bait in the barrel along with a few loud taps on the side of the barrel from his bait bucket. This just let the bear know he was heading out- almost like the dinner bell a farmer’s wife would ring when supper was served. The first few hours were slow as we were in there way early from what John normally puts hunters on stand. This gave us time to get our pulse slowed down to a normal level and take in some of the sounds that came from the thick Canadian bush. One of the sounds that we did not hear was the light footed black bear that appeared out of nowhere at 3 o’clock. Standing at 10 yards was a 200lb black bear that materialized out of the dark timber. Our pulse went right back to the top, but we quickly realized that this would not be the bear for us. These guys have much larger critters than this guy so we would hold out as long as we could. Lucky for us, we did not have to practice patience for long. At 4 o’clock on the nose a slob of a bear slipped in to the bait that I knew right off was a shooter. Low sagging belly, no neck, wide head, and short ears are all signs of a big bear and this old boy met every description to a tee. 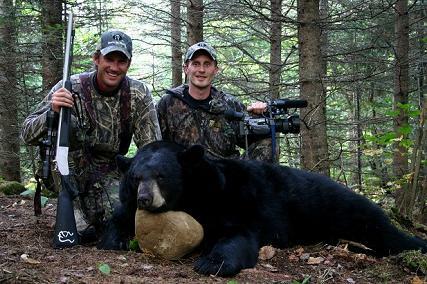 Not giving this bear any chance to slip out of our grasp, I touched off my new Knight Rolling Block and sent 290 grains of nastiness downrange in the form of a Knight Red Hot bullet into the vitals of what looked to be a Booner bear, nothing out of the norm for the guys at Dog Lake. The hit was money and within seconds we heard him crash just forty yards or so from our stands. Sweet! Did I mention that this was our first day to hunt and also my birthday? Sometimes the man upstairs just shines down and helps makes good things come of bad. To make that day even better, for once, the Weather Channel was right as it rained for the next two days straight. As it turned out, that would have been the one and only day I would have got to hunt on a six day hunt. The bear ended up tipping the scales at a whopping 340lbs and due to the Boone and Crockett required drying time; he has not yet been officially scored. Don’t let our tough experience deter you from crossing the border to go hunting. Most hunters get through customs without even the smallest glitch. I would, however, recommend that you don’t take a cameraman with you, HAHAHA! All jokes aside, we had a great time with the crew and hunters at Dog Lake Resort and would highly recommend every hunter cross the border one time in their life and see Mother Nature at her best.